I know this meal doesn’t look like much, but it’s one that I’m most proud of because it’s a weeknight dinner that I made sans-recipe, using only what was in the fridge and cupboard at home. 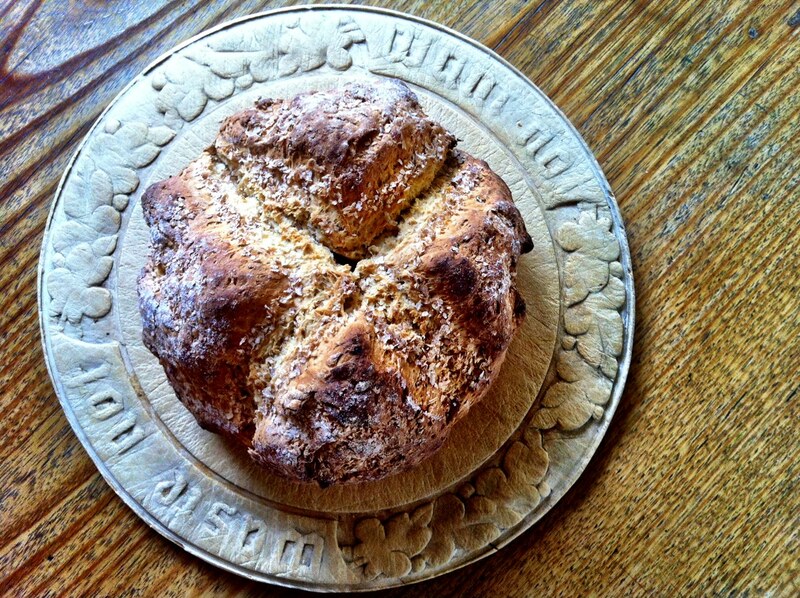 I was inspired by Sarah Wilson, who’s an ambassador for the International Love Food Hate Waste program, and her recent blog posts about respecting the food we have and clever tips on not wasting food – it reminded me of my great grandmothers ‘waste not, want not’ bread board. What was true decades ago in her kitchen, rings true in mine now. My appetite for food is always driven by trying something new and my motivation for cooking often comes from a love of the process – not just the end result, which leaves me forever off-loading baked goods and casseroles to friends. I look for inspiration in cookbooks, magazines, my travels, cooking shows, food blogs, restaurants, growers markets, everywhere really (yes, that’s me in the kitchen at work trying to peer into your Tupperware containers to see what you’re eating for lunch) – so I figure why not look inside my own fridge and cupboards for inspiration instead? Tonight I gave myself the challenge to go home and get creative. To be honest, I wasn’t entirely enthused by the idea – food is one of the things I most look forward to in life, so the thought of getting home late to cook a meal that might turn out to be half-baked, wasn’t doing it for me. – Veggies – I scrounged together a carrot; half a brown onion and rather dry lemon; some frozen spinach (I freeze fresh batches of it to throw into soups and pastas); a handful of cherry tomatoes and half-a-dozen shrivelled mushrooms that I had forgotten where even there! 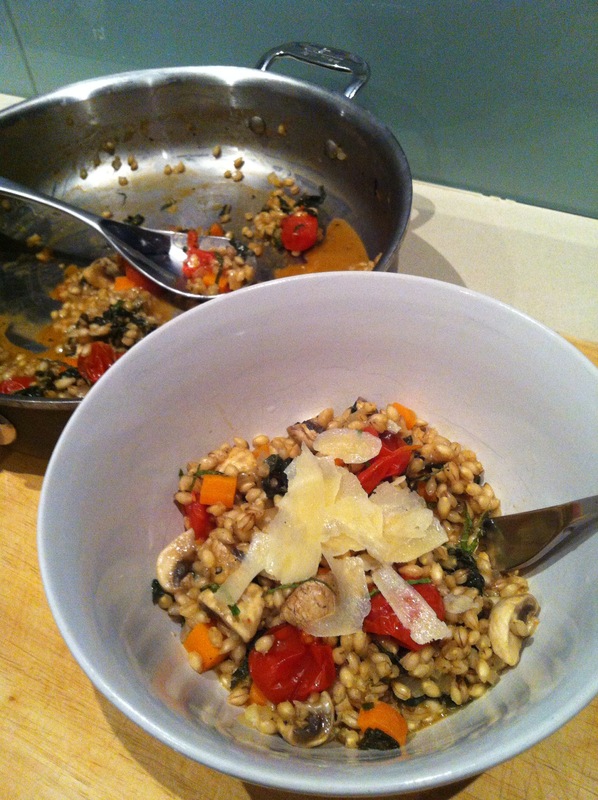 And this is what I made – a Vegetable barley risotto. Chuffed! Not only was it absolutely delicious but so satisfying knowing my resourcefulness had given love and life to food that may have gone to waste. Below is the recipe I ended up creating, but do what you will with what you have. And I’ll be taking up this challenge more often! 23 Jan	This entry was published on January 23, 2013 at 9:21 pm. It’s filed under Lucy's plate, Recipes, Uncategorized and tagged Barley, Risotto, Sarah Wilson, Vegetables. Bookmark the permalink. Follow any comments here with the RSS feed for this post.